Tonight's Vegan Test Kitchen idea came from a conversation with our friend Laura, who is going to participate in a local food competition. 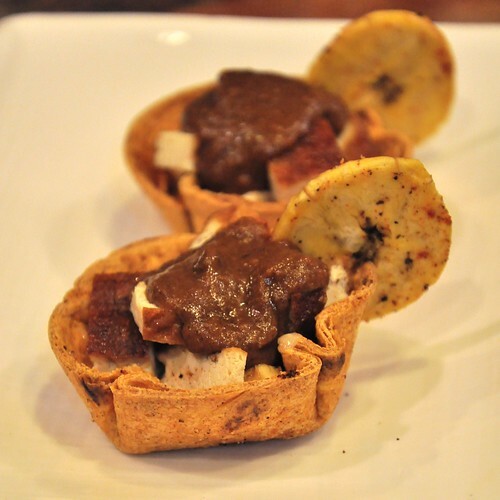 She wanted to combine polenta, mole and plantains in a small, one or two bite dish that would be full of flavor and not too difficult to assemble at the facility. 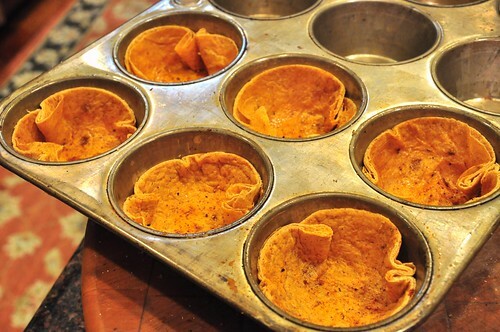 Starting with the base, we cut 2 1/2" rounds out of red chile tortilla shells which were sprayed lightly with olive oil and sprinkled with a little chipotle powder, salt and pepper on both sides before baking them in the muffin tins at 400F for 10 minutes. The cups came out crispy and aromatic. The plantain chip was a three-step process. First it was cut about 1/4" thick, sprinkled with salt, pepper and ancho powder, baked on a rack at 400F for 10 minutes. Second, we took them out and pounded them gently between a piece of lightly oiled parchment paper with the flat part of a meat mallet* until they were about 1/8" thick. At this point we dipped them in a 1:1 mixture of lime juice:water with a little salt added. Finally, they went back into the oven for another 10 minutes or so. To plate, we cut a little notch into the plantain chip so it would sit right on the edge of the tortilla cup. The plantain texture was more chewy than crisp, but we weren't going for a potato chip -- otherwise we would have deep-fried them. Taste-wise they were pretty much what we were going for -- plantains are what they are. The only thing we'll do next time is go with a 450F oven and a slightly more ripe plantain -- they were pretty blackened, with just a little yellow left, but they were still medium firm inside. The polenta started with 1 cup of fine cornmeal whisked into 4 cups of boiling water seasoned with 1 tbs. of salt. From there we turned down the heat to low and made it like a risotto, adding an additional 2 cups of water, 1/2 cup at a time here and there (don't sweat the timing, just don't let it scorch the bottom of the pan). Finally, we stirred in 2 tbs. of soy margarine, 2 tbs. of nutritional yeast, 1/2 cup of Daiya Mozzarella, 1 tsp. of ground Mexican Oregano and 1 tsp. of black pepper. Cook for an additional 3-4 minutes, and check for seasoning. Mole is a dish of layers and layers slowly revealing it's flavors over time. The challenge is in the organization at the beginning and getting all of the flavors to mesh at the end. We started with a combination of Susana Trilling and Rick Bayless recipes. Part one was the chiles. We had picked up ground chiles at Urban Herbs at the West Side Market a while back. The tricky part is figuring out how much pre-ground chiles is equal to fresh chiles ground. In the end we went with 2 tsp. of ancho, 2 tsp. of chile de arbol and 1 tsp. of chipotle. Set aside. Part three: In the same pan w/o oil add 2 tbs. almonds, 2 tbs. cashews and 1 tbs. pumpkin seeds, a cinnamon stick, 3 black peppercorns and 3 cloves for 5 minutes. Set aside. Part four: Add 3 tbs. of oil to the same pan and cook 1 1/2 tbs. of raisins (until plump, 1 minute), then 1 slice of bread until toasted on both sides, finally 1 small plantain diced and cooked until well browned, about 10 minutes. Set all aside. Part five: add a little more oil if needed and fry 1/2 cup of sesame seeds until browned, about 5 minutes. remove, let cool, grind in a spice grinder until it turns into a paste. Set aside. Part six: Wipe out the pan and add 1/2 lb. chopped tomatoes, 1/4 lb. chopped tomatillos (we had some leftover tomatillo salsa, about a 1/3 of a cup), 1/2 tsp thyme, and 1/2 tsp Mexican oregano over med-high heat, about 15 minutes. Transfer to a high-speed blender and add 1/2 cup of veg stock and blend well. Set aside. Part seven: Put the reserved nuts, bread, plantains, raisins, onion, garlic and spices in the high-speed blender, add about 1 cup of veg stock and puree. Part eight: In a heavy stockpot on med-low heat, add 2 tablespoons of olive oil and fry the chile mixture from step one, stirring constantly for 30-45 seconds. Be careful and don't let the chiles burn, or it'll ruin the dish. Add the tomato puree from step six, and fry until the liquid has almost evaporated, about 10 minutes. Add the the sesame seed paste from step five and ground ingredients from step seven, stirring constantly, about 10 minutes. Add 1 cup veg stock to the mole, stir to combine, cook for 20 minutes, stirring occasionally. Part nine: Add one disk of Mexican chocolate (about 3oz), broken up as small as you can make it -- we did it the spice grinder in small batches, but a large knife will also do the job. Stir until it melts. Part ten: As the mole thickens, slowly add more veg stock. Let simmer another 30 minutes, adding stock as needed. You're looking for a final sauce that should be thick enough to coat the back of a spoon. Check for salt -- you'll want enough to balance the slight bitterness from the chiles and chocolate. Things we learned: Mise en place is essential to this dish, it's very easy to lose track of where you are with this many "moving parts." Also, make sure your plantain is completely black or else they'll be too firm. * not just for pounding out seitan anymore!